Business analytics lies at the intersection of four disciplines, namely business strategy, business analysis, business intelligence and advanced analytics. In order to provide value to the organisation, business analytics have to serve a purpose, deliver new insights, be actionable, and in some cases also be very dynamic. This post is a high level summary of my presentation at the Enterprise IQ Future Enterprise 2013 Summit, held recently in Sydney. 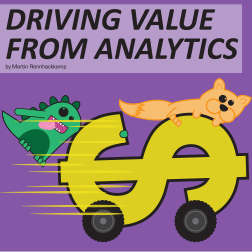 When we discuss value to the organisation, we need to keep in mind that revenue generation – although the most obvious – is not the only value-add that analytics can contribute. In some cases analytics can play a key role to achieve substantial savings or considerable process improvements that by itself can also make significant differences to the organisation’s bottom line, thereby also contributing value. To be purposeful analytics has to align with the key business functions, address management objectives or concerns, and be at an understandable level for the person acting on the insights. Analytics of value must deliver new insights, such as uncovering facts or information previously unknown, surface new cause-and-effect information or enable future-looking decision-making. Actionable means it must directly support decision-making and action-taking – i.e. it must lead to actions that integrate well with the organisational processes, such as initiating actions that improve or generate revenue. Put together, analytics must improve discovery and insight, determination and resolve, and innovation and creativity. In modern times, analytics must be more dynamic than periodically generated analytical models. It should be so dynamic that it brings analytical insights into the business operations and business processes. This requires a real-time, two-way flow of data and information between the operational and analytical components. It enables the organisation’s decision makers to continuously monitor and instantaneously react. Real-time analytics have become a reality in many organisations. For example in banks which literally have millions of customers, segmentation based campaigns are not targeted enough anymore. Trigger marketing is the process of applying analytics to predict which offers would interest customers as they are busy interacting with the bank. Purpose: interact more directly and personally with individual customers. Insight: prediction of which products would be suitable to individual customers. Action: offer more applicable products at the right moment to individual customers. Dynamic: taking place as individual customers interact with the bank. Value: larger uptake of more suitable products, much less campaign wastage irritating customers. Another useful and actionable application of real-time analytics is in healthcare insurance. It is too costly to attempt to recover a fraudulent claim, so by applying analytics healthcare insurers can predict with much more accuracy which claims may be fraudulent and first have them investigated before paying them out. This saves health insurers millions every year. The real-time aspect ensures that normal valid claims are still approved for payment in the normal interactive processing cycles. Insight: predict which claims may be fraudulent. Action: investigate likely fraudulent claims before paying them out. Dynamic: as individual claims are submitted, before payment. Value: huge reduction in costs trying to recover fraudulent claims paid out, usually written off. Real time analytics can be implemented through in-memory analytics or through streaming analytics. In-memory analytics is where the data that are used in the analytical modelling processes are loaded in memory before the modelling processes are applied. SAS, SAP and Kognito each have interesting but very different offerings in this area. Streaming analytics is where the analytical models are applied on the data items as they are being processed. The mechanics of streaming analytics applied to data-on-the-move are very different to conventional analytics applied to data-at-rest. Force structure on the data as early on in the process as possible. Filter the relevant data from the “noise” as early on in the process as possible. It obviously depends on the type of data you work with which of these two steps you apply first, but in most cases intelligent filtering works better on structured contextualised data. Another very important aspect of big data analytics is that it normally adds additional value to the organisation’s insights, rather than generating totally new insights. As an example, the sentiments expressed by customers on a Twitter feed or a Facebook post have much more value when it is analysed in the context of the customer’s buying behaviour and/or his interactions with the organisation. So in general – and again, this is hard to state as a rule, due to the vastly different types of big data – analytics applied to big data are best when the (filtered structured) big data are integrated with the other “BI data” already in the organisation. Of course there are exceptions, like large sets of scientific observations, where there is no other “BI data” to integrate with, but that is not the norm in most run-of-the-mill mainstream businesses. So in summary, for analytics to add value to the organisation, it has to be focused on a purpose, deliver new insights, and most importantly, be actionable by the organisation. In today’s fast-paced business world, dynamic real-time or near-time analytics is more and more becoming the norm, and if applied correctly can add tremendous value. For big data, applying structure, intelligent filtering and integration with existing data before applying the analytical models generally adds more value cost-effectively.